1991.028 item 202 - Main Street, opposite the Park, Brampton, Ont. 1991.028 item 203 - Off the park Brampton, Ont. 1991.028 item 204 - Main Street opposite the Park, Brampton, Ont. 1991.028 item 205 - A Pretty Spot opposite Public Park, Brampton, Ont. 1991.028 item 206 - At Grand Trunk [unreadable] Brampton, Ont. 1991.028 item 208 - On Wellington St. Brampton, Ont. 1991.028 item 209 - Chapel St Brampton. Item 1991.028 item 206 - At Grand Trunk [unreadable] Brampton, Ont. 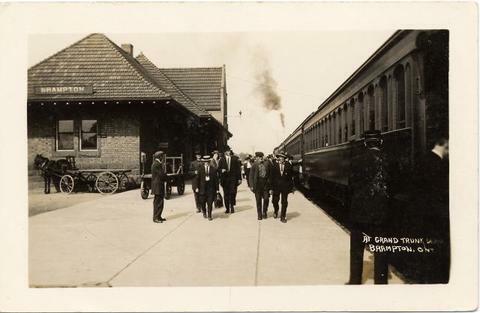 англійська » At Grand Trunk [unreadable] Brampton, Ont. Item consists of a real photo postcard of the Grand Trunk Railway station at Brampton, including a horse and plain wagon. A train is at the station.